2018 Top 50 True Freshman WR’s and their Impact on the Season. We will continue on with the 2018 Top 50 true freshman today and talk about the wide receivers. Similar to the RB position, more true freshman had an impact this past year for their team. 28 (56%) of the Top 50 wide receivers contributed in the 2018 season. One player hit 1,000 yards, Clemson’s PS#3 Justyn Ross (21.7 ypc) and 9 touchdowns. Next on the list is PS#12 Jaylen Waddle of Alabama 848 yards (18.8 ypc) and 7 touchdowns. 3rd PS# 2 Amon-Ra St Brown of USC had the most rec of the group with 60 for 750 yards (12.5 ypc) and 3 touchdowns. The top yards per catch in this group with at least 10 or more receptions goes to Justyn Ross of Clemson with 21.7 ypc on 40 receptions. 2nd with 20.6 ypc on 26 receptions was PS#26 Tre Turner of Virginia Tech. 3rd came in Seth Williams (PS#33) of Auburn with 20.5 from 26 receptions 534 yards and 5 touchdowns. Out of the Top 50, 18 players recorded at least 1 touchdown in 2018. The top 2 guys were listed above on the yards leaders Justyn Ross (9) & Jaylen Waddle (7). The Top 50 wide receivers from the 2018 class combined for 6,710 yards, 45 touchdowns and 15.5 yards per catch. 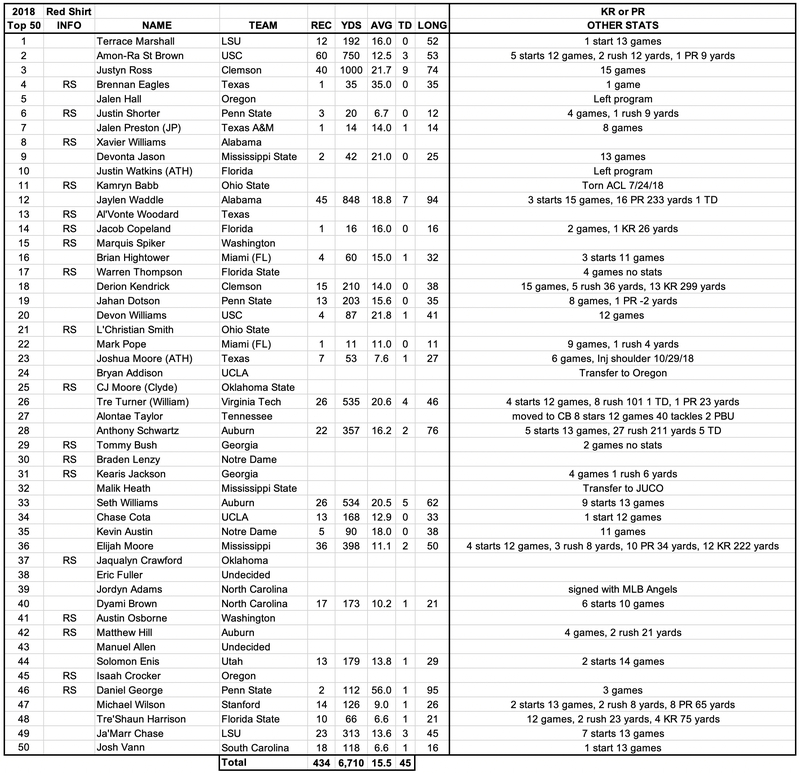 Here is the complete list of the 2018 Top 50 true frosh wide receivers and what they did last year. Top 50 True Frosh WR’s for 2019. On Friday we will move onto the Top 50 TE’s and their impact on the 2018 season.